This add-on for the Projectopia Core plugin enables you to sign Projectopia Clients up to recurring payment plans / Subscriptions via PayPal and Stripe. The plugin requires Projectopia Core v4.0.3 or higher. It also requires either a Stripe account, or a PayPal Business account that has Reference Transactions enabled. 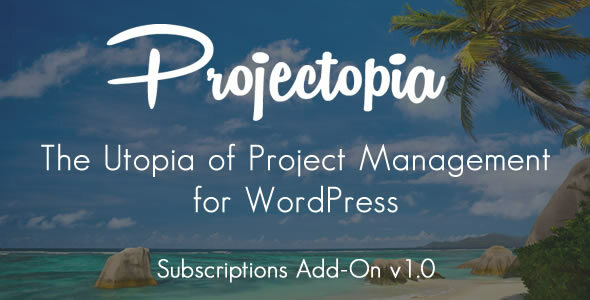 To install the plugin, first make sure you have Projectopia Core v4.0.3 or higher. Upload the zip file through WordPress and Activate the plugin. The configuration can be found in the Projectopia Admin Settings page, under the Subscriptions tab. The email templates here will already be populated with default values, but you can edit these if you wish. You also need to configure a Payment Gateway which will be used to charge the client through Paypal or Stripe. You can find these in the API / External Services tab of the settings. Note: We do not support 2checkout as a subscription payment method at this point.